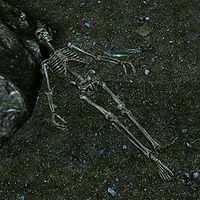 Nystrom is the skeleton of an adventurer found in the Twilight Sepulcher who tried to brave the Pilgrim's Path and failed. His attempt can be read about in his journal. Nystrom eventually met his end by the hands of his friend Anders, as can be read in his note. This page was last modified on 16 October 2017, at 10:55.